The intellectual high ground in business decision making is held by a handful of organizations: The Economist Intelligence Unit, Harvard Business Review, McKinsey Global Institute, and Strategy+Business. I think Rich Karlgaard, the publisher of Forbes, is also a bright light. He is in touch with Silicon Valley. 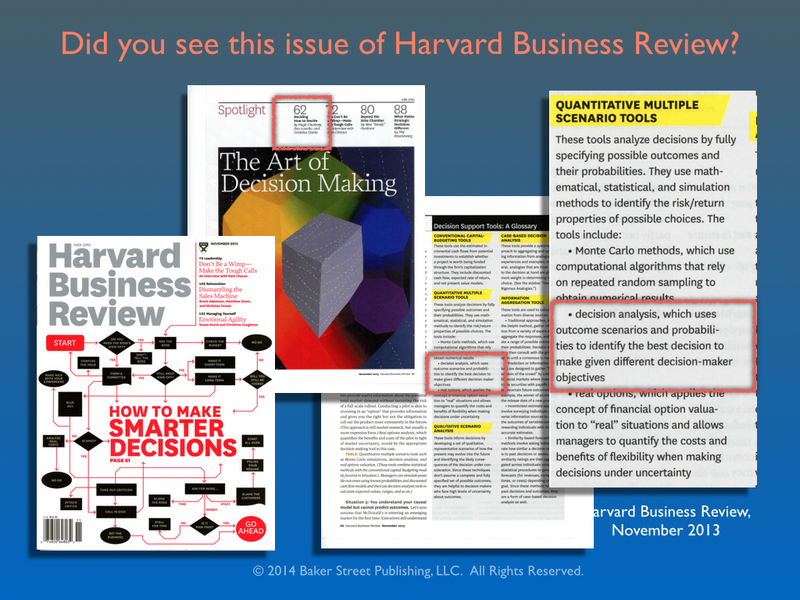 Recently, the Harvard Business Review did an issue with “Smart Decisions” in bold letters on the cover and four lead articles about, “the Art of Decision Making.” The field of decision analysis was relegated to one small paragraph. Decision engineering was not mentioned at all. This lack of acknowledgement concerns me. Frankly, it baffles me. Is it some kind of East Coast conspiracy to throw a log in the spokes of the Silicon Valley juggernaut? Is it an oversight? The field of decision analysis was established in the 1960s by Howard Raiffa at Harvard and Ron Howard at Stanford. Decision analysis courses today look pretty much like they did when I taught them 40 years ago. In the meantime, decision engineering as practiced by consultants and corporate decision coaches has evolved. Decision engineering has come a long way since the “trees” courses of the 70’s. At a recent celebration Ron Howard and some other people who were present at the birthing of decision analysis fifty years ago, said that in retrospect the field should have been called decision engineering. Ron Howard teaches decision engineering at Stanford. Decision engineering is part of a sequence of courses that starts with decision analysis. In other words, decision analysis is a sort of foundational course. Decision engineers need to know about decision analysis. But decision analysts don’t necessarily know about decision engineering. I am a decision engineer. Since my days as a decision analysis teacher forty years ago I have learned about decision framing, design, process, facilitation, project management, and organizational learning. I studied decision analysis with Ron Howard at Stanford in the 1970’s. It changed my world view. Since graduate school I have engineered very complicated technical decisions and I have engineered strategic decisions for the world’s largest corporations globally at the top levels. I hobnob with CEO’s. I have worked in virtually every industry known to man. I have started consulting companies and sold my interest in consulting companies. I have trained hundreds of “strategic planners” and so called “bean counters” in decision engineering processes and tools. I have worked in Europe, Asia, South America, and the Middle East. I have facilitated multi-national, multi-cultural teams. I have sat on Boards of Directors for private companies and non-profits for upwards of 35 years. Today I am a publisher. My company, Baker Street has just published a book, Transactive Energy: A Sustainable Business and Regulatory Model for Electricity. I am a decision engineer. I want the world to know more about decision engineering. I made a presentation at the recent INFORMS Conference in San Francisco titled, The Collaborative Design Process and Decision Engineering. 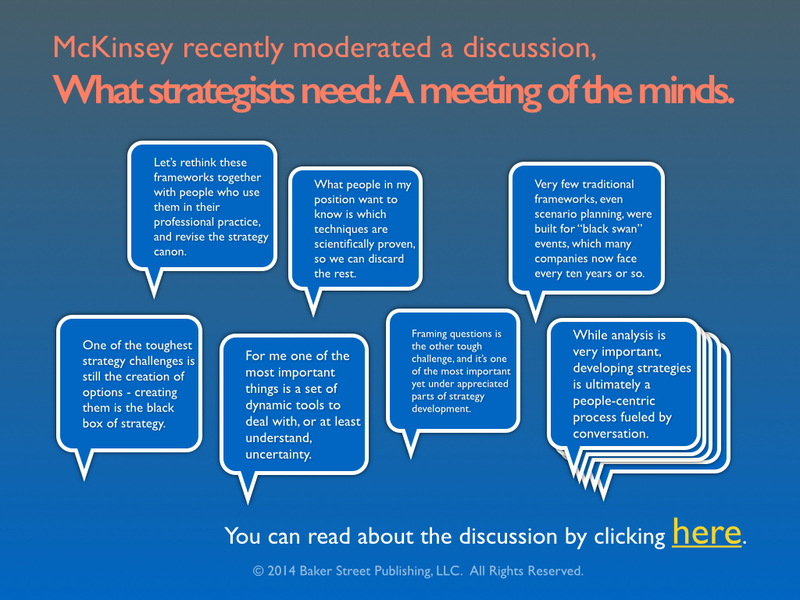 The presentation is framed as, “This is what I would say if McKinsey invited me to one of their strategy workshops.” You can view the presentation on Slideshare along with other presentations on decision engineering and decision coaching. I think McKinsey is a wonderful organization. I hope they will include at least one decision engineer in their next workshop on strategic decision making.